Linda Mackie is a professional photographer specializing in family, lifestyle, fashion and commercial photography that gets you noticed. Her passion is creating souldful, timeless images with a modern and contemporary perspective. 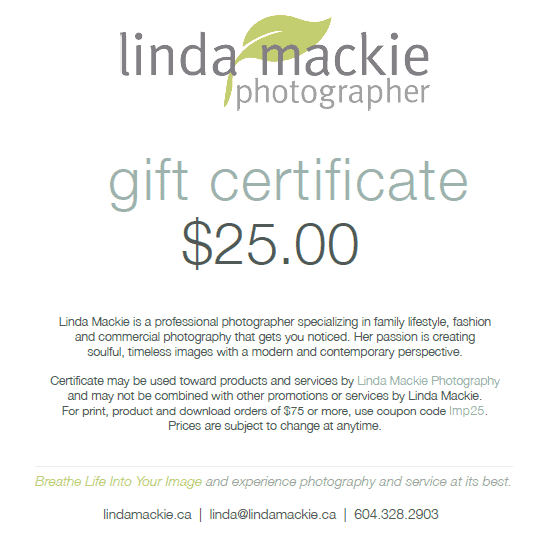 Certificate may be used toward products and services by Linda Mackie Photography and may not be combined with other promotions or services by Linda Mackie. For print, product and download orders of $75 or more, use coupon code lmp25. Prices are subject to change at anytime. Bring Life into your Image and experience photography and service at its best.